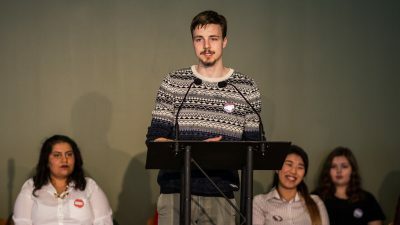 In the second SUBStage forum, the three candidates for Students’ Union vice-president (academic) presented platform points that covered mental health, affordability of course materials for students, and the implementation of interdisciplinary Indigenous courses. Candidate and third-year science student Tiffany Bruce spoke of increasing for opportunities for student success, improving access to mental health careers, and supporting students’ mental health. 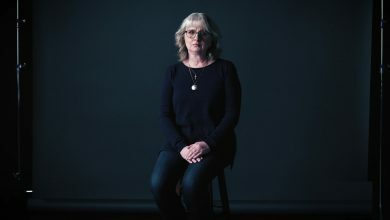 Bruce said she’d implement a 24-hour general mental health hotline that would connect to places such as the Peer Support Centre, the Landing, and Counseling and Clinical Services. Candidate and L’Association des Universitaires de la Faculté Saint-Jean (AUFSJ) councillor Cristiana Pop focused on implementing open educational resources, raising awareness around mental health accommodations, implementing interdisciplinary Indigenous course content, and conducting more research for student needs. “I think faculties have a responsibility to educate their professors on how to include Indigenous knowledge in their classrooms,” Pop said. 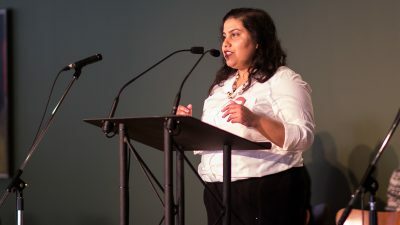 Student governance officer and candidate Akanksha Bhatnagar said she hopes to create a student census, improve academic advising in the face of budget cuts, and advocate for open educational resources and more flexibility in course materials. 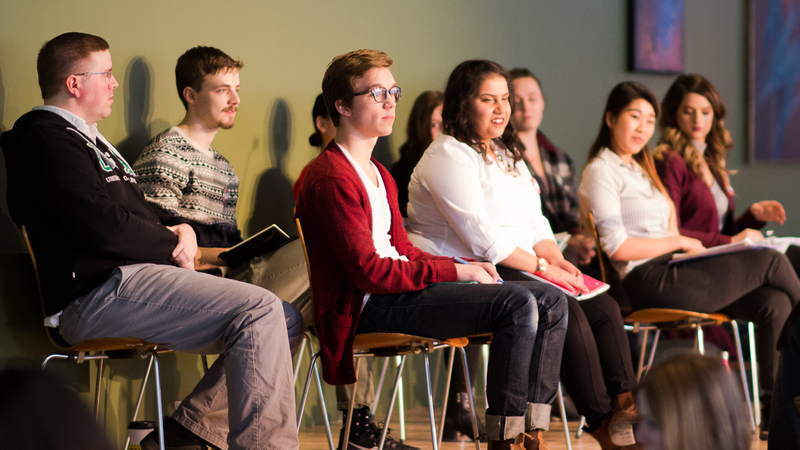 As with the first SUBStage forum, candidates were asked about reconciliation in their platform. 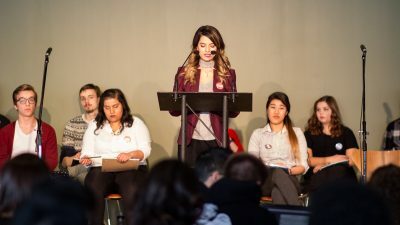 A member of the audience voiced concerns about reconciliation being used as a campaign buzzword, and wanted to know what concrete work the candidates would do for reconciliation. Pop said she understands the fear of reconciliation being tokenized. She said while she has been working on decolonization practices since before she ran, she doesn’t know everything about it. To tackle reconciliation, she said she wants to work with Indigenous student leaders as well as push for interdisciplinary Indigenous courses. Vice-president (academic) candidate Christiana Pop. Bhatnagar said she wants to include land acknowledgments on syllabi and have faculty-specific Indigenous courses. The last answer came from Bruce, who echoed sentiments about interdisciplinary Indigenous classes said by the other candidates. 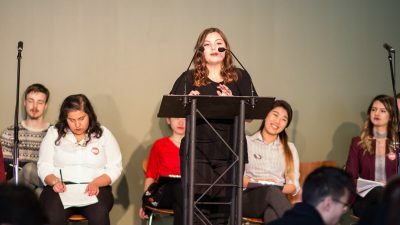 She also stressed the need for university policies around what campus security and students will take in regards to discrimination and microaggressions, as well as the need for more safe spaces. “It sounds awful and no one wants to hear it, but we need more security around the areas we have for these groups,” Bruce said. 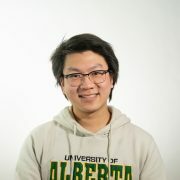 Issues regarding affordable residence, child-care support, and health and dental plan changes dominated discussion for the three vice-president (student life) candidates. 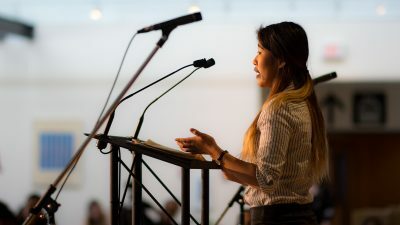 On strengthening residence associations following the de-recognition of the East Campus’ Students Association earlier this year, candidate and current HUB Community Association president Michelle Kim emphasized the importance of creating a transition program for elected executives. She said she blames inadequate training for the elected East Campus association president as a reason for its de-recognition. Both candidates Stephen Raitz and Andre Bourgeois said they want to conduct surveys to assess residence needs first, letting resident concerns guide how the SU should direct re-creation of the East Campus’ Students Association. On managing residence costs, all three candidates emphasized tying rates to changes in the consumer price index (CPI). Bourgeouis argued that CPI better reflects market changes in consumer goods and services, representing a more predictable rate of change as opposed to the academic price index (API), which reflects rising institutional costs. Kim questioned her fellow candidates on the renewal of the health and dental student insurance plan. Kim said she would advocate for more flexible options for students, including potentially a cheaper plan that would cover just health and dental. Raitz and Bourgeois said they want opt-out options to be maintained. 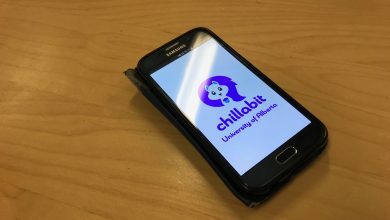 When questioned by students about a lack of family-friendly events on campus during the open questions period, Raitz said he would use the “manpower” of Week of Welcome to make a change. 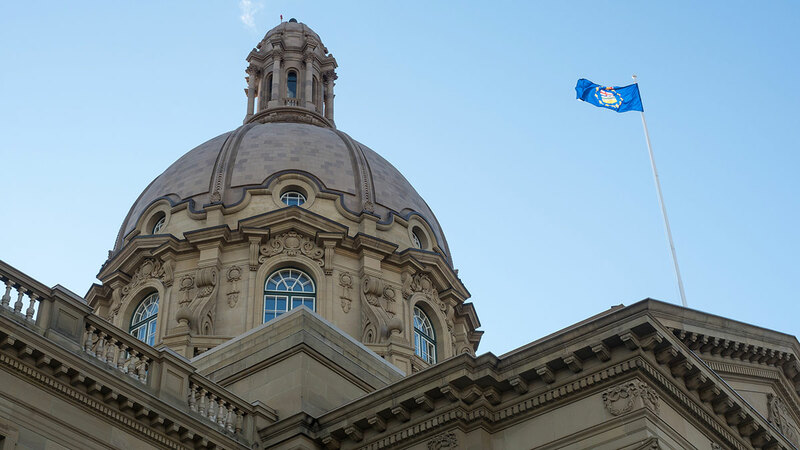 Kim said she would work with graduate students and Michener Park residence, while Bourgeois advocated for the inclusion of the six child-care facilities currently on campus under the $25-a-day Alberta government child-care program. Undergraduate Board of Governors representative candidates show if they understand the position. Promises on international student’s tuition and basic knowledge about the Board of Governors representative position were the main points that were tackled by the two candidates vying for the job. Undergraduate Board of Governors representative candidate Levi Flaman. 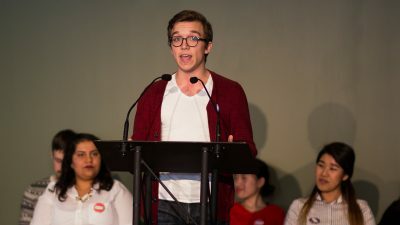 At the start of the forum, Levi Flaman said that his platform would involve examining issues relating to both international and domestic tuition, residence rent, and residence meal plans. 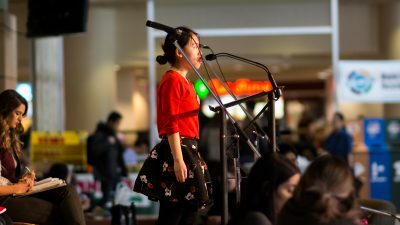 Yiming Chen said that her platform would be based on lowering international student tuition and giving international students a voice. During the debate portion of the forum, Flaman asked Chen what subcommittee within the Board of Governors she would choose to sit on. Chen seemed to misunderstand the question and answered that she would choose the Students’ Union. Flaman said he would try to get a spot on the Board’s Finance and Property Committee, saying it had the greatest impact on the day to day issues students face. Afterward, Chen asked what Flaman would do to stop increases in international students tuition. 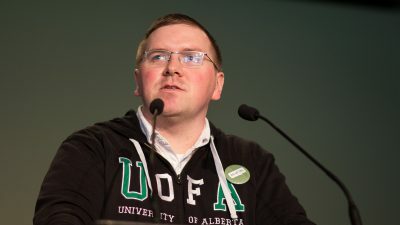 Flaman said he can’t promise to reduce international student tuition as his power on the board is limited, but promised to work with other student representatives. 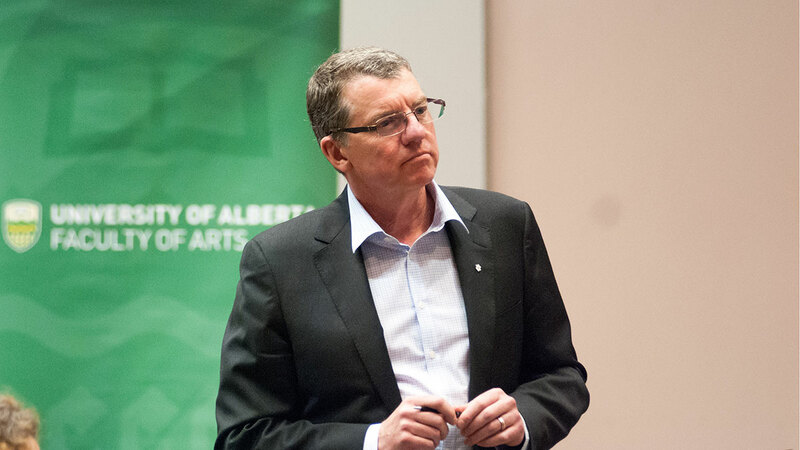 “I’m not going to go in and say that I could freeze or lower international student tuition because I’m only one person out of 21 on that board,” he said. Chen blamed rising international tuition costs on lack of international representation. A question from the audience asked how the candidates would respond to arguments among the Board on the university’s use of API rather than CPI. Flaman said he would familiarize himself with the issue and arguments. He believes that API is unpredictable. Chen said she did not understand the question and that she would look into the issue. The “yes” side for the Campus Recreational and Enhancement Fund (CREF) plebiscite made their case for why students should continue to support the fund. Morgan Strynadka, a volunteer for the campaign, said money from the fund is available to all student groups to help set up initiatives that benefit recreational health on campus. Strynadka said 39 groups received funding last year for activities such as drop-in swimming, Wilson Climbing Centre activities, and other club sports. Currently, students pay $4.10 towards the fund, and the fee does not have an opt-out option.